Gwadar Expo 2019 is an important event in terms of the city’s development. Dubbed as the ‘key to global opportunities’ the two-day exhibition offers the perfect opportunity for investors to network and meet influential officials directly involved in the region. Organised by the China Overseas Ports Holding Company, the Expo was already set to be a pivotal moment in Gwadar’s history but that has been reinforced by recent news. 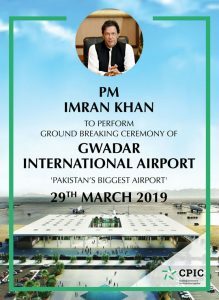 It’s been confirmed that Prime Minister Imran Khan will kick off long awaited construction of Gwadar International Airport – a significant move for all concerned. When is Gwadar Expo 2019? Gwadar Expo 2019 is a two day event from Thursday March 28th to Friday March 29th inclusive. It’s being held in the Free Zone at Gwadar City and full details of location can be found on the official website. Representatives from many industries that are central to Gwadar development will be in attendance. Energy is key to the rise of the city so visitors can expect to meet with exhibitors from the worlds of oil and gas processing and also those representing petrochemicals. Food, vehicle manufacturing, garments and textiles and many other sectors will also be on the agenda. It’s an important two days but the confirmed news regarding the airport is set to take centre stage. Is work on the Gwadar International Airport about to begin? From there, a number of key companies and organisations are tagged in and they will be directly involved in the airport either during its construction or when it is finished. Investors will now be tuning into Gwadar Expo 2019 with renewed enthusiasm as Imran Khan cements the long-awaited construction of this vital artery. What does this mean for Gwadar Investors? The confirmed news in regards to the airport should be of significance to investors who have already committed to buying property in Gwadar and to those who have been considering a purchase. 2019 was already set to be a landmark year for the city with other projects underway while the first phase handover of property was completed in February. When complete, Gwadar International will be the biggest in Pakistan and will overshadow existing structures in Karachi, Islamabad and other parts of the country. It is capable of hosting huge modern-day aircraft including new Airbus and Boeings and with an investment of $230 million, it’s clearly a crucial part of the entire Gwadar development project. Investors should certainly welcome the news: The commencement of construction has always seemed imminent but it’s always pleasing to see this confirmed. Gwadar Expo 2019 is an important event in its own right but suddenly it has a new focus.